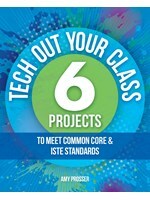 To support teachers as they use classroom technology to transform learning, the International Society for Technology in Education (ISTE®) today announced a new book, Tech Out Your Class: 6 Projects to Meet Common Core & ISTE Standards. Written by classroom teacher and ed tech enthusiast Amy Prosser, this guide recommends approaching technology projects with the same attention to detail and critical thinking required of traditional learning experiences. By weaving technology into time-tested practices—such as researching, writing and presenting—students and educators will gain technology skills and confidence while meeting learning objectives. Tech Out Your Class walks educators through six technology-rich, customizable projects aligned to Common Core and ISTE Standards. Beginning with a look at the objectives, Prosser then presents subject-specific recommendations for tailoring the project to fit English, math, science, social studies, foreign language or art classrooms. A discussion of applicable technology tools accompanies each project, followed by step-by-step guidance, grading considerations, examples and tips on troubleshooting. Infused with technology, traditional classroom assignments are shown in a new light, as in Project 2, "Epic Student Presentations." Drawing inspiration from Ignite sessions and the Pecha Kucha System, Prosser shows how the oral presentation (dreaded by students and teachers alike) can be transformed via technology into a dynamic platform for showcasing student voice and boosting public speaking skills. This project, along with others in this book, demonstrate the ways technology can enrich learning; empower students and teachers; and boost the communication, creativity and critical-thinking skills vital for digital age learners. Concise and clearly outlined, this resource is the perfect addition to a busy teacher’s toolbox. Tech Out Your Class author Prosser is a technology teacher at a high school in Los Angeles, California, and a Google Certified Innovator. She has presented on technology integration at conferences, school sites and online. In addition to her work in the classroom, Prosser has worked for Common Sense Media as a professional ed tech reviewer.